Blue is seen as a constant factor in our lives, being related with the sky and water. Blue is one of the most popular colours and described as the favourite colour by many people. From a colour psychology perspective, it evokes feelings of calmness and serenity. This colour exhibits an inner security and confidence. It promotes both mental and physical relaxation and is particularly suited for rooms, for which you wish to wind down, such as bedrooms or bathrooms. Blue rooms have been shown to reduce heart rate and decrease blood pressure. Communication: Blue relates to one-to-one verbal communication and self-expression. Peace and calm: The colour blue induces calm and peace within us, particularly the deeper shades. Honesty: Blue is the colour of truth. Authority: The darker the colour blue, the more authority it has. Wisdom: Blue enhances the wisdom of the intellect. Positive keywords include: loyalty, trust and integrity, tactful, reliability and responsibility, conservatism and perseverance, caring and concern, idealistic and orderly, authority, devotion and contemplation, peaceful and calm. Negative keywords include: depressed and sad, too passive, self-righteous, superstitious and emotionally unstable, too conservative and old-fashioned, predictable and weak. In interiors the relaxing nature of blue makes it a great choice for kid’s rooms either as a paint colour for the walls or in accessories and bedding. 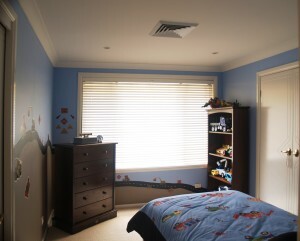 If your child is very energetic and agile use a blue room to calm him down and provide the ground for a good night’s sleep. 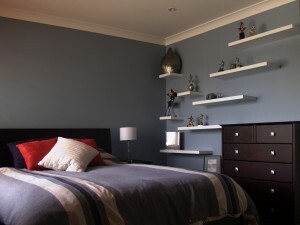 It is also useful for children’s bedrooms as they can simply alter the colour of the accents and accessories as they get older and change the way blue looks. By adding a neutral to blue we can get a wide range of blues, adding black we get navy blue, adding white we get the powder blue. Bear this in mind when you are matching colours with blue, if white has been used then it is often best to stick to that tone of colour to coordinate with it. It is open and inviting when teamed with yellow, it creates the perfect beach illusion. Choose your blue wisely – dark shades when overused can produce feelings of sadness, whilst the wrong shade of light blue can make a room feel cold. Also take care of using too much blue in an office, it’s soothing quality could potentially decrease staff productivity. 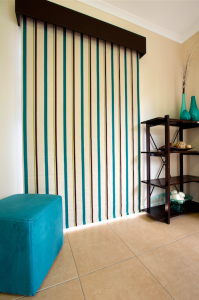 A good option is to bring energy and warmth into the space with accents such a coloured fabrics, wood, white trims and light blinds or curtains. Using blue accents in furniture or fabrics is another clever idea to introduce a little calming colour into a room without it overpowering the space. Dark navy blue is the most serious and powerful blue, whereas lighter tones of aqua can be uplifting and energising. Turquoise enhances creativity, inspiration and transformation. The most common use for blue is in monochromatic colour scheme, where blues of different shades, tints or tones are combined. This creates a wonderfully tranquil space, sedative yet secure. Think about how the colour blue makes us feel when choosing your next colour scheme!